It’s no secret that berries are good for us. Strawberries, blueberries, raspberries—they’re all packed with antioxidants, fiber, and many other all-star nutrients. However, there’s one often-overlooked berry that’s also oozing with health benefits: cranberries. And no, they’re not just great in your mom’s delicious Thanksgiving sauce. Cranberries are actually higher in antioxidants than other fruits and berries, says nutritionist Jenna Gorham, RDN. They’re also lower in sugar than many other fruits, with only four grams of natural sugar per cup. (Hence, their tart flavor.) Not too shabby. When you think of cranberry juice, the first thing that comes to mind is that it’s said to help with urinary tract infections, which board-certified family medicine physician and The 10-Day Total Body Transformation author Shilpi Agarwal, MD, confirms. Fiber is great for overall gut health, and cranberries are packed with it—one cup has about 4.6 grams of fiber, Graham says. “This is important because we need fiber for a healthy digestive system and to maintain regular bowel movements,” Dr. Agarwal adds. Plus, fiber keeps you fuller longer, which means you’re less likely to reach for a not-so-healthy snack. “Research is also suggesting that regular consumption of low-calorie cranberry juice can reduce LDL or ‘bad’ cholesterol and triglycerides, another component of cholesterol,” Dr. Agarwal says. If you are chugging cranberry juice, make sure it’s all natural without added sugar—studies show the sweet stuff has the opposite effect on cholesterol levels. Remember those PACs? The urinary tract isn’t the only place these anti-microbial, anti-inflammatory antioxidants work their magic. 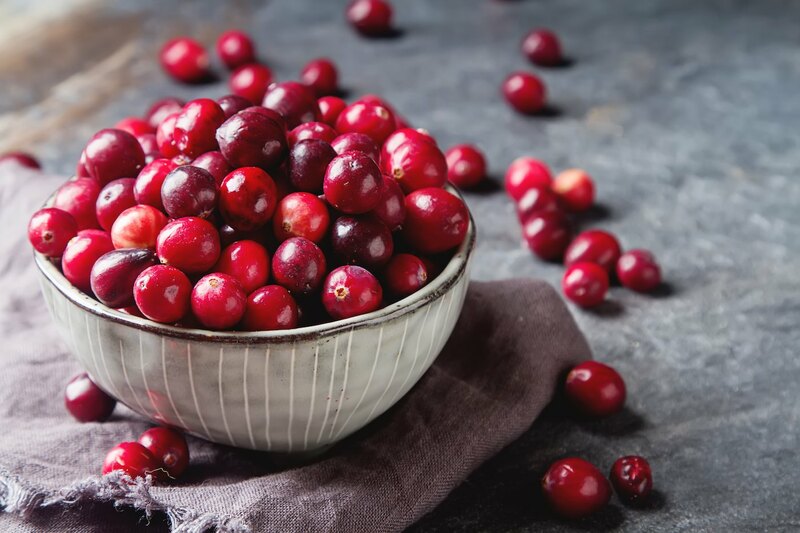 “Preliminary studies show that cranberries can help reduce bacteria’s ability to stick and grow in the oral cavity and limit gum disease, in the same way as they do with UTIs,” Dr. Agarwal says. Eating whole cranberries in their natural form is definitely the best way to soak up all their powerful antioxidants and nutrients. “Cranberries are easy to add into smoothies, a warm bowl of oatmeal, or homemade breads and muffins.” Gorham says. “They also make great salsas and sandwich spreads.” And if you’re feeling festive, you can try out her cranberry kombucha mule (yum!) or her Thanksgiving grilled cheese sandwich recipes. The thing that deters many people from incorporating cranberries into recipes is their tart taste, Gorham explains, which is why so many dishes that include them are loaded with sugar. If you’re not digging the tartness but still want to consume the healthy berry, then she suggests countering it with a splash of 100 percent orange juice or other whole fruits to dial up the sweetness. “Heating and cooking cranberries can also help to release some of their natural sweetness,” she says. Cranberry supplements are another way to get your dose. However, both Dr. Agarwal and Gorham mainly recommend this for those who are prone to frequent UTIs. Otherwise, stick to eating or drinking your cranberries—doesn’t a cranberry mojito mocktail sound a whole lot tastier, anyway? Cranberry’s the hottest color in activewear this season—here are eight pieces you can buy right now. And cranberry seed oil is also making an appearance in beauty products.